First things first, the GIANTS won their division last night. Yes! Yes! Yes! This is a not a game day style post. 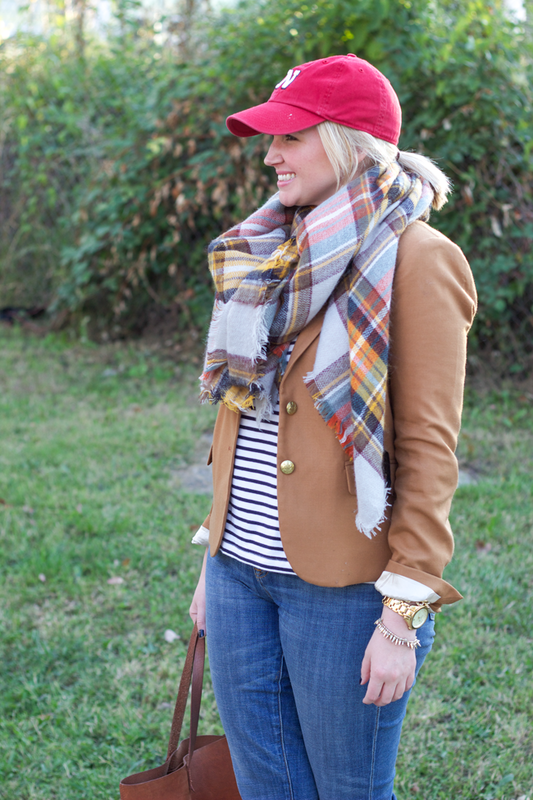 I repeat, this is not a game day style post. I know far better than to wear anything but Husker red on game days. Think of this as an “its Sunday and you’ve got to pull yourself together style post (hence the hat covering the unwashed hair). So why the huskers/N hat? We are a Nebraska Cornhuskers household thanks to Aaron’s upbringing and as evident by the Huskers welcome mat that greets you outside our apartment door (the first of many compromises while unpacking). As for me, I’m a big fan of anything with a giant N on it for obvious reasons. I kind of hate to feature something here that is hard to get. That is kind of the antithesis of what my blog is supposed to be about—easy and accessible style. 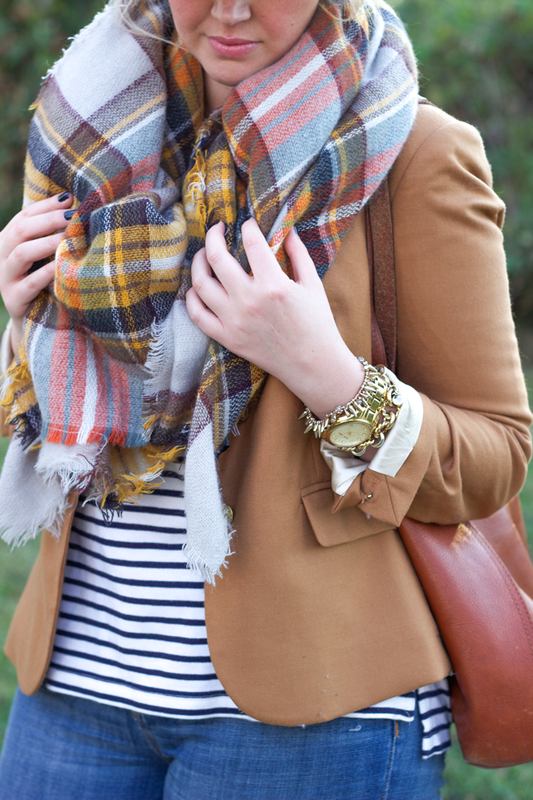 And here I go featuring a scarf that always sells out. Well friends, its cozy as all hell and I’m going to be wearing a lot of it this fall so apologies in advance. I’ve listed a few alternative below as well as the link to the actual scarf itself where you can sign up to receive an email when its back in stock. Does that make it better? Hope so. A quick review on this J.Crew Factory Keating Boy Blazer: I paid just under $70 for the blazer with a gilt city 30% off code on top of a 50% off in store sale. It is certainly not the highest of quality and I would not recommend paying more than $70 for it. If you can get it on sale, wonderful. You go glen coco. If not, keep looking. The quality doesn’t match the price. 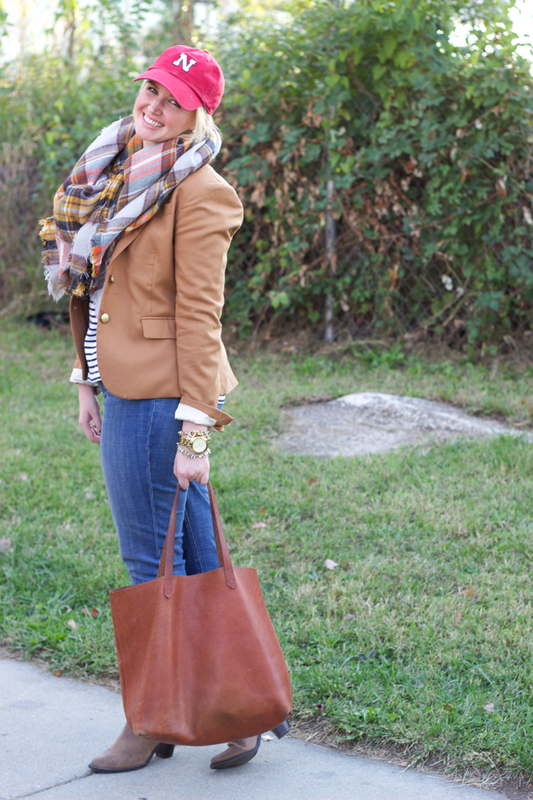 If you’re looking for a cheaper alternative all together, check out this blazer from Target. Lastly, these booties. Remember I told you on Friday you could wear them all year? I’m wearing a Target look alike from last year but get ready to see them a lot around here. love this casual outfit! the blazer definitely looks high quality, such a bummer that it's not :( I always have good luck with Target blazers!